Fashion is great because you can enjoy it on your own, or share it with other people. Sometimes I go on autopilot when getting dressed for work, and one of the ways I snap out of it is to see what my friends are wearing and become inspired by (aka steal) their style. Today, I am welcoming the lovely Jess, to show her take on a printed work outfit. "It finally has gotten warm and spring-like, so I can break out my spring and summer wardrobe from my closet. 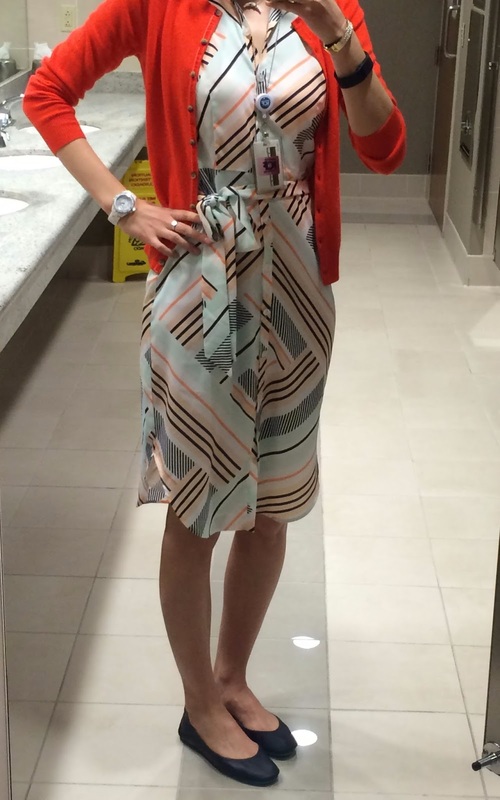 I'm wearing a retro-feeling synthetic, sleeveless shirt dress from Ann Taylor in a fun print with a tie belt. While I could wear no sleeves at my office, I prefer not to, and the AC gets cold, so I'm wearing my Boden cashmere classic crew-neck cardigan (in red-orange). My shoes are Tieks in California Navy- I take the metro to work and walk to the metro so I rarely wear heels and comfortable shoes are a must. My ceramic watch is Bungi and my bracelet and necklace are Stella and Dot."